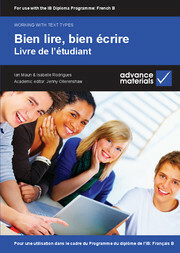 Bien lire, bien écrire is designed for use by IB Diploma Language B students and is in the Advance Materials' Working with Text Types series. Each of the 18 units in this full-colour book provides students with a model text and gives them exercises that help them to analyse the structure and language of the text. Students then work up to writing a similar type of text in a similar register of language. Bien lire, bien écrire - livre du professeur provides answers and teacher guidance to accompany each of the 18 units in the full-colour Student's Book. The approach trains students to reflect on the communicative purpose of each text and to use the language appropriate to the type of text and its audience. It teaches them to structure arguments in a clear, coherent and convincing way. The approach is lively and collaborative, encouraging students to work in pairs and small groups. Detailed lesson plans to accompany the student's book. Transforms writing into an interactive whole class/group activity. Trains students to use structured arguments as well as vocabularies. Football féminine: pour ou contre?.